Princess Beatrice was the youngest of Queen Victoria and Prince Albert’s nine children. She was born on the 14th of April 1857 at Buckingham Palace. Queen Victoria shocked the public and the church by using “blessed chloroform” to ease her pains during her final child’s delivery. Despite having eight children already, Victoria and Albert were besotted with their baby girl who was called pretty and plump by Victoria and “the most amusing baby we have had” by Albert. Victoria is well known for her dislike of babies, but she seemed to make an exception for Beatrice and doted on the child, playing with her often and bathing her herself unlike with the other children. 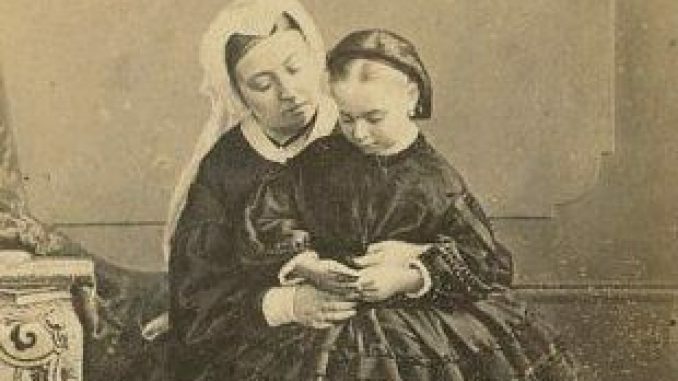 Victoria had acknowledged that Beatrice would be the couple’s final child and seemed to wish to retain Beatrice’s youth and innocence by bestowing upon her the nickname of ‘baby’. 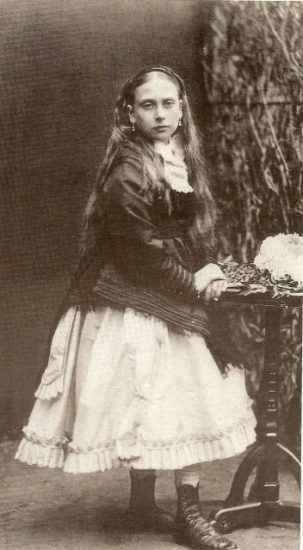 Beatrice’s early years coincided with the final years of her father Prince Albert’s life, and it is said that the child brought her father a lot of joy before his untimely death. As the older children were growing up and leaving home, it was nice for Victoria and Albert to watch their youngest child grow up. Albert spent a lot of time with Beatrice and noticed her wit and intelligence, Victoria too sang her daughter’s praises in many letters to family members. This final child had completed the family, and while she was strictly educated like her siblings, she enjoyed more leisure time and affection from her parents, especially Victoria who had sadly grown distant from some of the older children. This feeling of favouritism was not always easy for Beatrice to bear and she felt an enormous sense of pressure to be her mother’s constant companion as she grew up and it became more of a job for her than a normal mother-daughter relationship. Victoria began to depend upon Beatrice upon being widowed; Prince Albert died in 1861 when Beatrice was four years old. 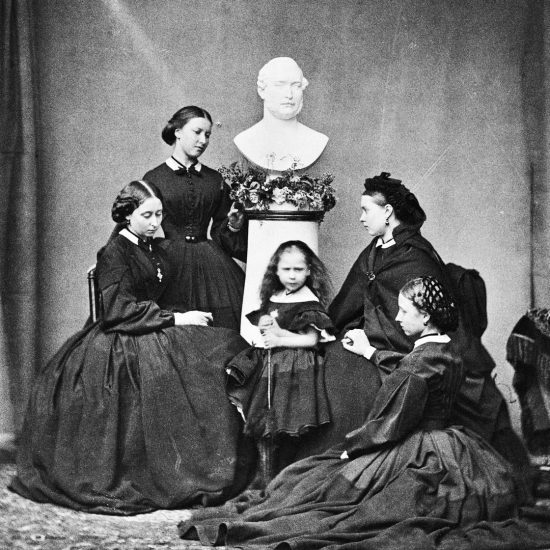 Queen Victoria went into mourning for her husband and was so deeply grieved by his death that she never quite recovered, often shutting herself away from all but her daughters Alice and Beatrice. Victoria often wrapped little Beatrice in some of her father’s clothing and held her in her arms; it was clear that Beatrice and Albert were intertwined in Victoria’s eyes and the loss of Albert made her hold Beatrice a little too close. As Beatrice grew, she began to take on tasks to help Victoria in governance and became her mother’s secretary. Beatrice would often write letters on behalf of her mother and was involved in political correspondence. Victoria said that she could not cope by herself and it was clear that Beatrice was a necessary part of Victoria’s staff as well as family. As time went by, Victoria entrusted Beatrice with a role she is well remembered for; the writing down of her journals which Victoria began to dictate to Beatrice from 1871 onwards. Working and caring for her mother full-time meant that Beatrice had no free time for friendships or romance and if ever the idea of marriage was uttered, it was quickly hushed up again. Victoria was selfishly unwilling to let her ‘baby’ go and feared being left behind by all of her children. There were a number of suitors over the years, but the plans always fell through or were stopped by Victoria. That was until Beatrice fell in love while attending her niece’s wedding in Darmstadt. Beatrice, by this point twenty-seven-years-old, had fallen for Prince Henry of Battenberg and was determined to marry him. Upon hearing Beatrice’s plans to marry, Victoria was furious and did not speak to her daughter for over six months! The pair lived together but Victoria only communicated with Beatrice by sending notes. Beatrice’s sister-in-law Alexandra of Denmark – The Princess of Wales – and her sister Victoria – The Princess Royal – eventually got through to Victoria and she reluctantly consented to the marriage. There was one condition, however, Beatrice was not allowed to move away; her husband would have to make his home with her and her mother. Beatrice was married to Henry in 1885 at Osborne house on the Isle of Wight where the family spent a lot of time. She was given a beautiful wedding surrounded by ten nieces who acted as bridesmaid. 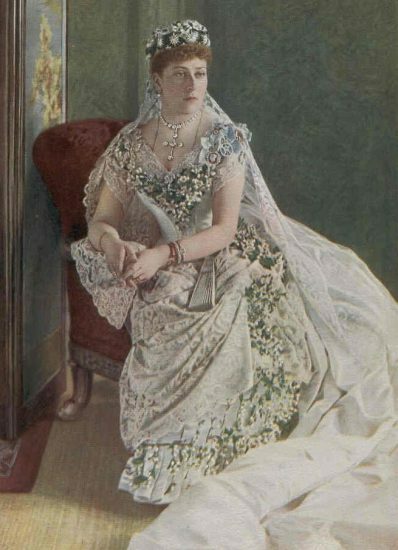 Beatrice was married in a splendid gown, paired with her mother’s wedding veil. As the new couple set of just a few miles down the road for a brief honeymoon, Victoria finally succumbed to her overwhelming feelings and broke down. The next decade of Beatrice’s life was lived as a fine balancing act. 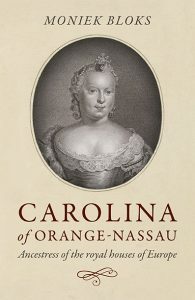 She had to balance life as her mother’s companion and secretary with the life of a wife and mother. She was deeply in love with her husband Henry, and the pair had four children together in the first six years of their marriage, three sons and a daughter who went on to become Queen of Spain. Beatrice always struggled to placate her husband’s wishes for a more active life, and he especially yearned to join in with military activities on the continent. Queen Victoria gave him the role of Governor of the Isle of Wight in 1889, but Henry still longed for military victory. Queen Victoria finally relented to Henry’s wishes, but her apprehensions were proven right when Henry died of malaria during the Anglo-Asante war. Beatrice was devastated, after just ten years together she had lost her beloved Henry and went back to her mother’s side full-time. After her husband’s death, Beatrice was then awarded the Governorship of the Isle of Wight for herself. Beatrice was often so busy with her duties and her mother that it was said she did not bond well with her children who would act out in school to gain her attention. In 1901, Beatrice lost her mother and life-long companion Queen Victoria and her brother Edward VII, whom she was not close to, ascended to the throne. Beatrice could do little but watch her brother remove or destroy photographs of their mother from Osborne house that he did not wish the public to see and carve up the royal properties which had afforded her privacy on the Isle of Wight. Beatrice was left with Osborne cottage where she continued to live in her role of governor of the Isle. Beatrice is most well remembered by historians for the activities in her later years in which she continued her mother’s work. As in her earlier years, Beatrice had written out Victoria’s journals for her, in later life she gathered up all of her mother’s letters and diaries from the 1830s onwards and set about destroying some items and heavily editing others. Historians and readers of Victoria’s diaries are often grateful for Beatrice’s labour of love as it means we have a vast wealth of materials written by Victoria. On the other hand, people are often furious at the fact the items are edited; often sexual themes or things which could have caused family or political issues if they got out were removed. So while the letters and diaries are a wonderful resource, Beatrice destroyed the integrity of the materials in order to preserve her mother’s memory. Beatrice finished this mammoth task in 1931 and today there are over a hundred volumes of the journals in the national archives. Over time, Beatrice’s appearances at court dwindled, and she lived a more and more private life. Beatrice was devastated by the loss of her beloved sons Maurice in 1914 and Leopold in 1922 and stayed at home often. She corresponded with her two remaining children and enjoyed visits from them and continued to write into her old age. Beatrice’s final publications were as late as 1941. On the 26th of October 1944, Beatrice died in her sleep at the age of eighty-seven. She had seen a great change to the world in her lifetime and had witnessed the reigns of four monarchs as well as two world wars. Beatrice died at the home of relatives in Sussex but was buried with her husband on her beloved Isle of Wight with just her son Alexander and his wife attending the private ceremony. Beatrice was the last of Victoria’s children to die, over six decades after the death of her sister Princess Alice.